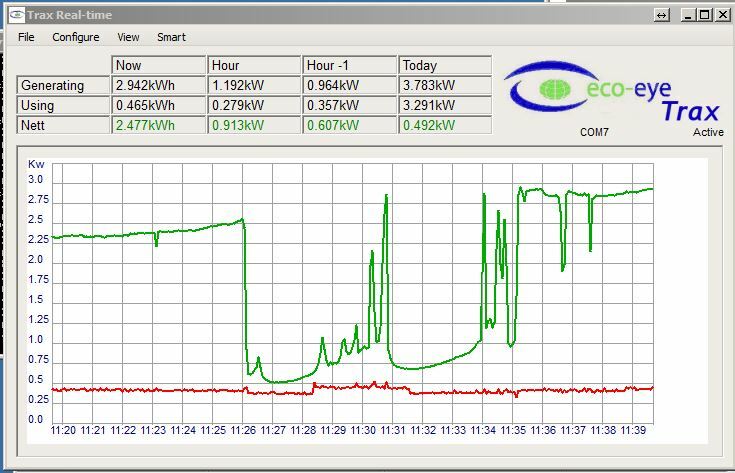 If you want to manage your electricity usage data on a computer or want to input your own daily usage targets, then Eco-eye Smart is for you. 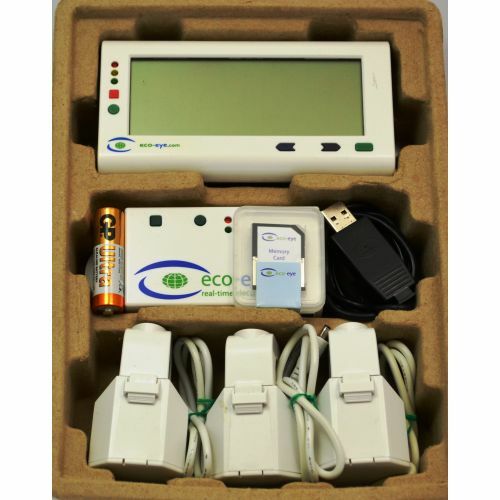 Eco-eye Smart comes with more advanced features than the standard Elite or Mini monitors and can save data to a computer via the optional Data Storage Card or USB Cable, both of which use our free Trax software. 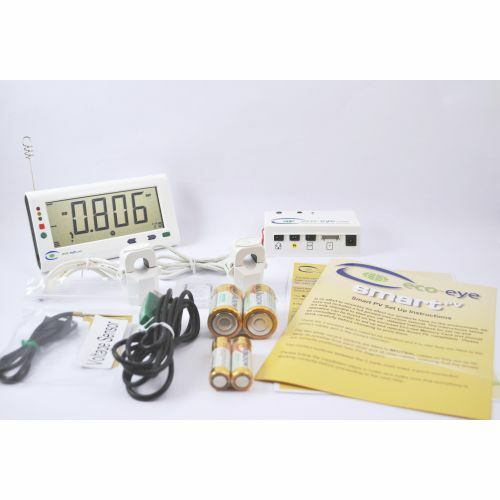 Eco Eye Trax is supplied to provide the computer side functionality for Eco-eye products. It consists of 2 programs, trax_usb for the real-time flow of readings from the USB cable and trax_card that downloads the readings from the memory card and has a graphical display that can show summary information for the day, week, month and year or detailed information at a 4-second interval. If this is not enough you can export the readings to a CSV file for use in spreadsheets. Using the Eco-eye Memory Card. 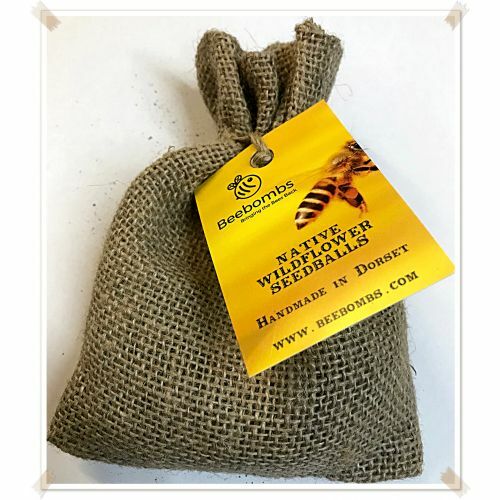 The Memory card records every reading received by Smart and when it is put into your computer the latest readings are transferred and added to the database for your property. 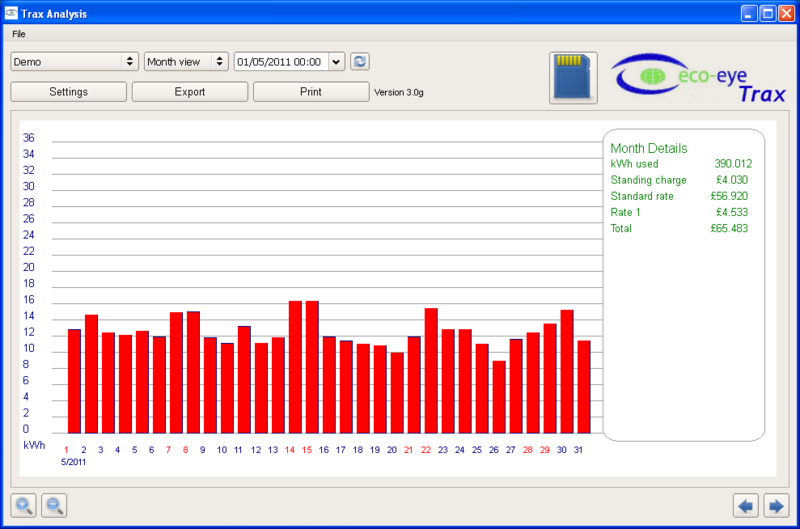 The readings can then be viewed (without the need for the card to be in the computer) in a number of different ways with graphs and period totals as well as allow export to a spreadsheet file. The memory card is inserted in Smart with the contacts facing you and Smart uses an icon in the bottom right corner of the screen to show the card status. Because Smart buffers the readings then writes a block at a time, the MC icon is on solid until just before a write is due when it will flash. The card should not be removed from Smart while the icon is flashing to avoid loss of readings on the card. 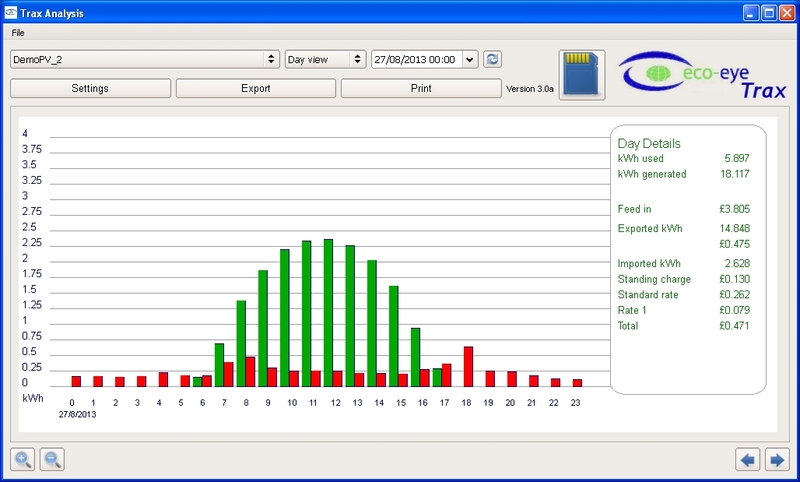 Trax_card uses bar graphs and, for the summary screens, a text box on the right with totals for the displayed period. 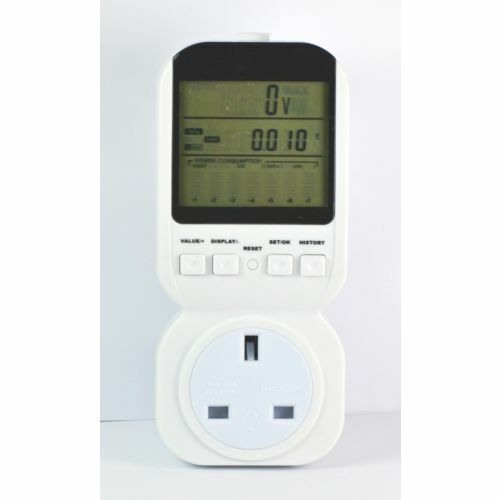 There are options for setting up a standing charge and up to 6 tariffs. For PV users, feed-in rates can be entered. A detailed graph is available showing every single reading as well as summaries by hour, day, week, month and year. Using the Eco-eye USB cable. When the USB cable connects your Smart to your computer the readings are transferred in real-time and displayed on a graph. 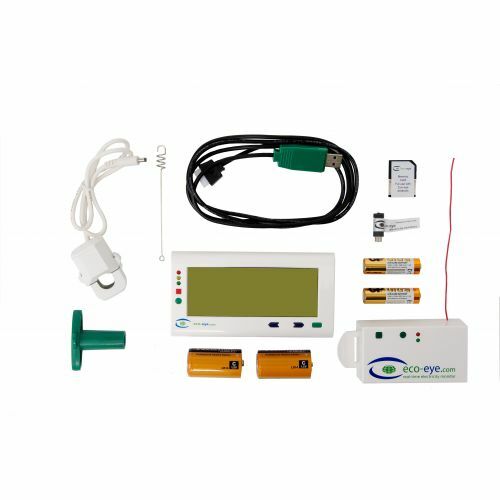 These readings can be used to email reports and alerts or to send a summary to various Internet of Things sites such as Things peak and PVoutput. The readings from the card cannot be transferred over the USB cable. 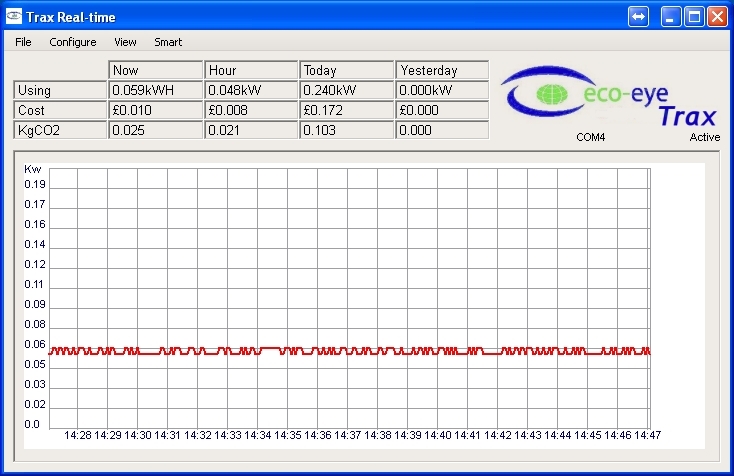 Trax_usb uses a line graph to display the readings as they come in with the current status in the text at the top of the window. The stream of live data from Smart is as follows. 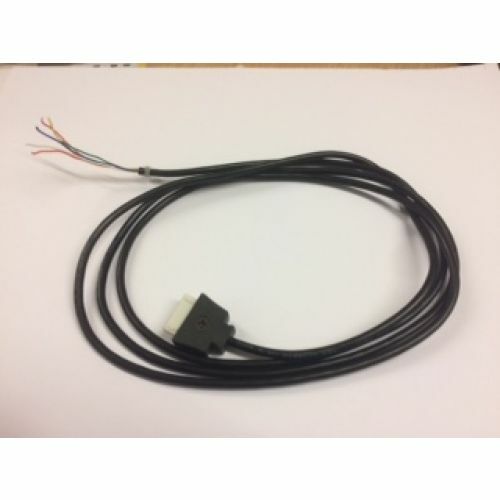 The USB cable simulates a serial connection and is at 19200 baud, 8 bits, 1 stop, no parity.